The MyPBX U100 is an IP PBX appliance developed by Yeastar. This IP PBX appliance, while compact, is feature rich and provides a perfect solution for a small to medium sized businesses. Here we will configure the MyPBX U100 through the web interface to properly route both incoming and outgoing calls to and from Callcentric. The information presented in this guide is based on firmware revision 15.18.0.24 of the MyPBX U100. If you are running a different firmware revision (or a different model of the MyPBXUx00 series of products), some of menu options and settings may be different. This guide assumes that you have administrative access to the MyPBX U100 administration web interface. 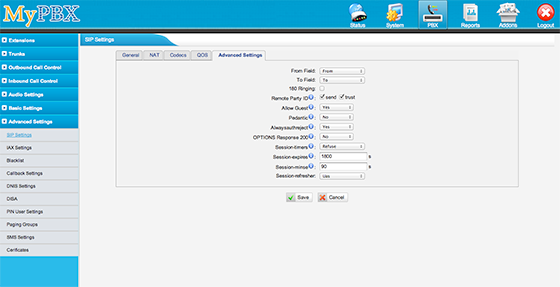 Log into the U100 administrative interface and click on PBX on the top menu bar. 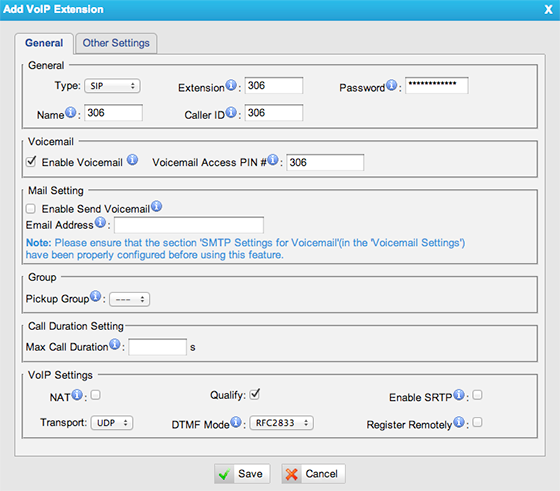 From there, locate the heading FXS/VoIP Extensions from the side menu and click on the Extensions option. By default, the PBX should include a handful of pre-defined extensions that you can edit; or if you would like to you can create a new extension. To create a new extension, click the Add Extension button at the top of the loaded page. From the Add Extensions page, enter your Extension Number, name, and a password for the extension of your PBX. Once you have entered your credentials for this extension, please click on the Save button to continue. Click on the yellow button labeled Apply Config at the top of the screen to apply the changes you just made. Next we will be defining a new SIP trunk on your PBX. 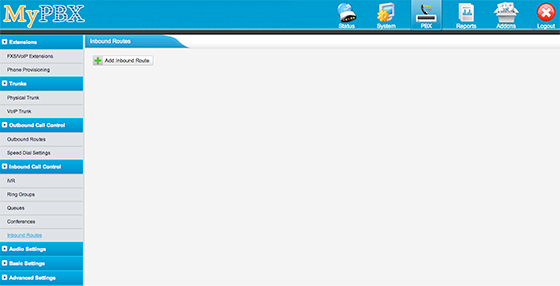 To do so, locate the link VoIP Trunk from the side menu bar on the left. Click the Add VoIP Trunk button from the loaded page. A pop-up window should appear. Authorization Name This is either the default extension 1777MYCCID OR 1777MYCCIDEXT, where 1777MYCCID is the 1777 number assigned to you by Callcentric and EXT is the three digit extension you are trying to register this UA to. From User This is either the default extension 1777MYCCID OR 1777MYCCIDEXT, where 1777MYCCID is the 1777 number assigned to you by Callcentric and EXT is the three digit extension you are trying to register this UA to. 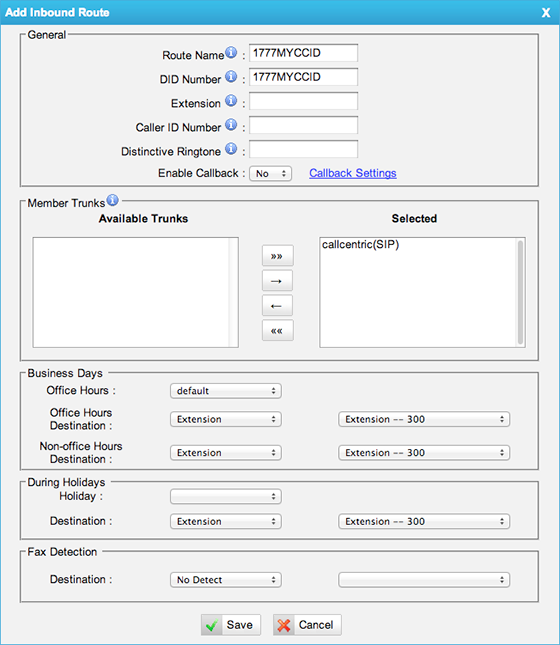 To create a new outbound route for your PBX, locate the link Outbound Routes from the side menu bar on the left. Click the Add Outbound Rule button from the loaded page. A pop-up window should appear. Member Extensions In our example, we want all extensions of this PBX, the ability to place outgoing calls through our SIP trunk; in which we've moved all extensions to the Selected column. 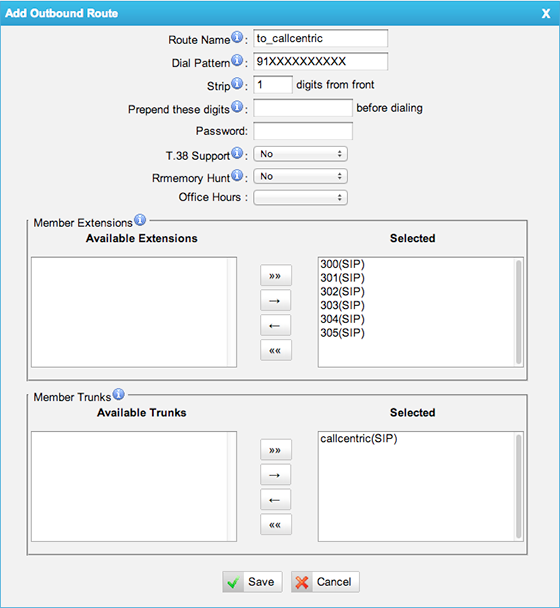 Member Trunks Move the callcentric trunk in the Selected column. You will now be required to configure the inbound routing for incoming calls. You may send incoming calls to any pre-configured location such an extension or an IVR, among other choices. Here we select the extension created earlier as an example. From the left menu selection, click on Inbound Routes. Click the Add Inbound Rule button from the loaded page. A pop-up window should appear. * If you have acquired a phone number from us, please replace 1777MYCCID with your phone number (i.e. _12125551000). Business Days / During Holidays In our example, we want to route incoming calls towards extension 300 of our PBX regardless of the time. From the side menu options, locate the heading SIP Settings and click on the General tab. 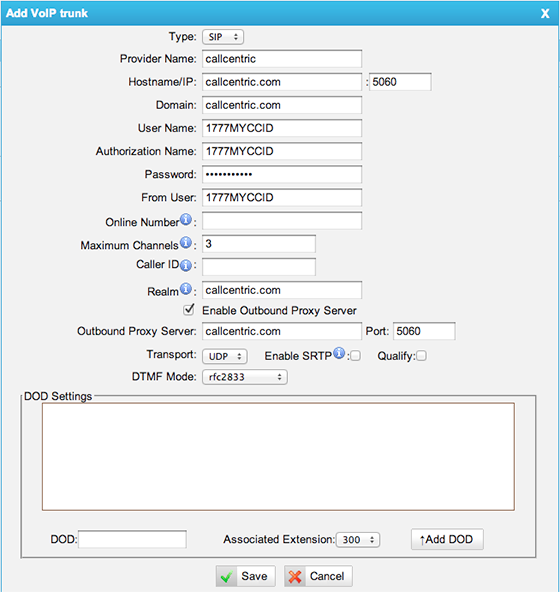 Use the IP address or hostname for your MyPBX u100 along with "300" (the extension created earlier which is the username) and the password for the 300 extension to connect to your MyPBX u100.